Melt butters and oils and honey together over low heat or in the microwave. Let cool. Blend in eggs, vanilla and roasted pureed pumpkin. Mix together dry ingredients and add to wet mixture. Blend well. Pour into prepared pan ( I used a pie tin with a sheet of parchment paper) and bake in oven at 175-C (350-F) degrees for 30-35 minutes. Remove from oven and cool completely. 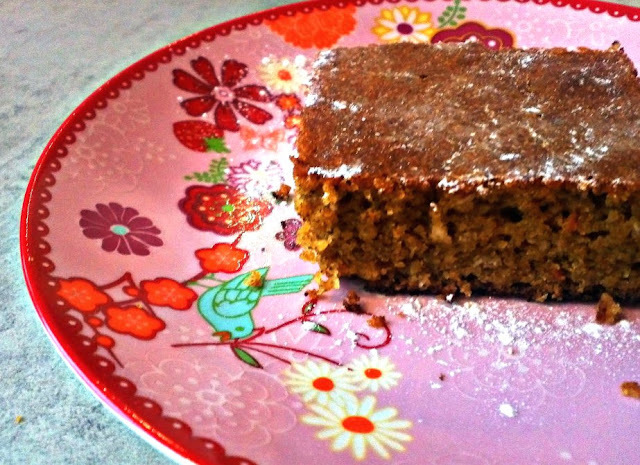 This is a healthy snacking cake so to make it a bit sweeter or fattier - it's very good served with butter or honey butter. Lately, I've been whipping my honey butter using the 100% organic coconut cooking cream in place of cow butter. It's really delicious especially when you add some other simple ingredients to it like cinnamon and a hint of maple extract (Mapleine).